INDIA RUNWAY WEEK, Yes you read that right. 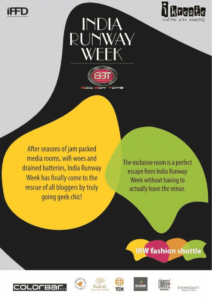 The India Runway Week is starting from 28th April till 30th April. This time India Runway Week is hosting its 8th season. With great success in all seasons, this time too India Runway Week is all set to showcase their best designs. Every year you meet up various designers. Also, a lot of new faces are emerging out with great talent and designs which are totally breathtaking. The Weavers plays a very important part in Fashion Industry. They are well known for bringing the India heritage at extreme level. But, undoubtedly the weavers have always been a victim of devoted hierarchical system. They had to face exploitation, since they are at the bottom of the system. But, There are Organisations that gave the tinker Support to the minors and with that supporting hands they generated livelihood of rural artisans. These Organisation contributed a lot in order to improvise the lives of the women artisans working with it and even helped to improvise the economic as well as the social status. These Organisations tried not only to help the artisans to become earners but also tried to keep the tradition culture alive. With this efforts, they are basically trying to preserve India’s Cultural Heritage. SoCHE, a company reviving languishing and less popular hand embroidery practiced by women around the border areas of Barmer. Gestures by Kriti, a company providing livelihood support and outreach initiative that began in 1999, to promote ethical, sustainable and socially conscious thinking & buying of ‘community made’ products. These organisations will present the immense work of artisans at the current season of India Runway Week Summer 2017. This time there’s gonna be something different. I am Eagerly Waiting for INDIA RUNWAY WEEK 2017. Can’t wait to see all the collections showcased at India Runway Week. Let’s gather together and embrace the handwork of our Artisans and Weavers who have left no stone unturned. Let’s Celebrate their Victory Together.